Try out some of these fun activities for seniors with dementia. As our senior loved ones advance through the stages of Alzheimer’s disease (or any other form of dementia), their ability to engage in everyday activities lessens, in spite of their need to remain busy and to feel productive. As a result, discovering ways to engage in fun activities for the elderly can be a challenge. If you’re encountering this now, you know that each stage of Alzheimer’s disease presents its own unique challenges. 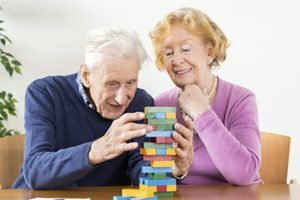 The first obstacle may be helping your loved one remain interested in an activity – even one that had been a favorite hobby at one time. Another concern may be finding an activity that matches her physical ability. Reading, for instance, may have been a beloved pastime when she was younger. But if her eyesight is failing and her comprehension has become more limited, reading may now be too difficult. This can be especially frustrating if she remembers enjoying this activity in the past. And yet, remaining active is important, helping to minimize disruptive behaviors and emotions. Keep the senior’s current abilities and limitations in mind when selecting an activity. Be aware of the time of day you want her to engage in the activity. Most individuals with Alzheimer’s react differently to directions in the evening, as compared to earlier in the day. Keep the focus of the activity on the enjoyment of it. It’s the experience that’s important, not the end result. Provide easy-to-understand instructions, one task at a time, and provide support as needed – but don’t take over. Focus on a sense of purpose in the activity. For instance, state that you’d like to send a special thank-you card to someone and then invite the senior to help you. Replace an activity for a behavior. If the senior is rubbing her hand on the table, hand her a cloth and encourage her to wipe the table. Or, if she is moving her feet on the floor, play some music so she can tap them to the beat. If one activity isn’t working, it may just be the wrong time of day, or it may be too complicated. Try again later, or modify the activity. Pay attention to the time. Keep the activities short if her attention span seems to be limited. Helping your loved one remain engaged in fun activities for the elderly, even for short periods of time, is good for both of you, but at Hired Hands Homecare, we understand that it isn’t always easy, and we’re here to help. Our skilled and reliable caregivers provide in-home care services that are personalized to each individual, and our care team is specially trained in dementia care, providing a wealth of resources to help families navigate the Alzheimer’s journey. Call us at (866) 940-4343 for a free in-home consultation to learn more.